Over the last decade the midtown area known as Grand Center has physically changed; new construction of buildings with rehabs of many others, bonds issued, etc. Most outside observers would say the changes have been positive. What’s largely unknown to many is the behind the scene dealings of the many players & legal entities involved, it wasn’t always pretty. The commons will serve as a focal point for art, culture and public dialogue. 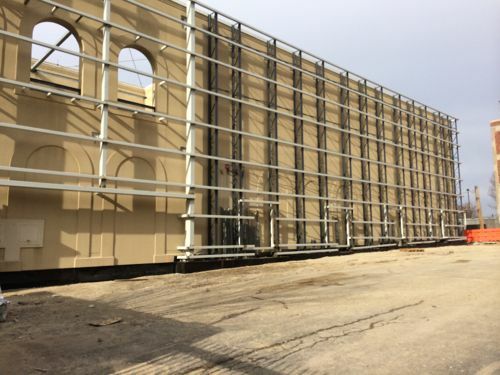 It will feature interactive te3chnology, large-screen projects on the entire east wall of the Nine Network building, performance stages for small groups, multiple seating areas, green space and a window into Nine’s studio. Construction was expected to be finished around October 2013. You can see a promotional video here. Concept for the Public Media Commons with Nine Net on the left and St. Louis Public Radio on the right, click image to view source. Fast forward to January 1, 2014, months after it was originally slated to be completed, and it doesn’t look like much has happened. The most visible change is the frame for the west screen. 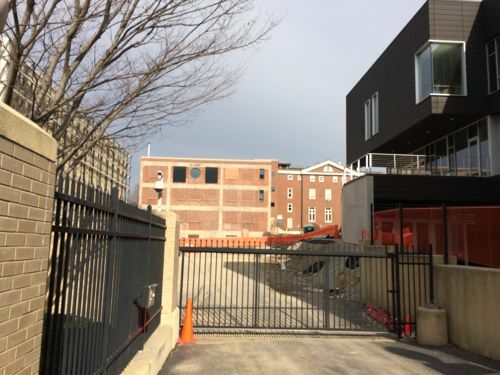 Since construction began on the Public Media Commons, there has been considerable ongoing work – some of it visible from the street, including foundation work and the recent installation of grids covering the east exterior wall of the Nine Network building. But much of the ongoing work has been behind-the-scenes infrastructure, programming and electrical work not visible from the street. It is a complex project that has required intricate integration of the technology. As you probably know we’re planning for the Public Media Commons to be an innovative focal point for art, culture and public dialogue with large-screen projections, a performance stage, and digital interaction. The Commons will also include a view of the Nine Network studios in action. 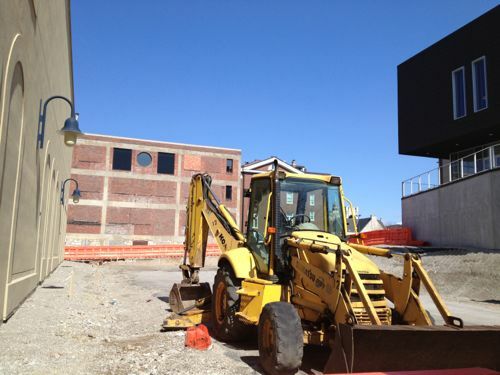 We had planned to complete the project sooner, but we can say with a high level of confidence that the Public Media Commons will open this summer of 2014. I remain skeptical, but we’ll see. Ok, let’s dive into the dirty laundry! Over the years I’ve touched on some aspects, like in February 2007 when I wrote St. Louis University is a Secular Institution, Not a Catholic or Jesuit University. SLU prevailed in court but by then Grand Center’s plan to use eminent-domain to take a property from a business owner was dead. The auto repair shop at 3699 Olive (at Vandeventer) remains in business. Click image for story from the St. Louis American. 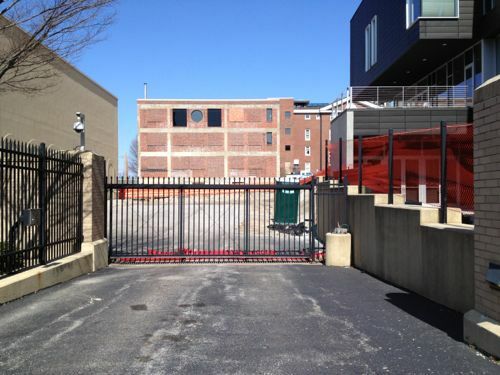 The redevelopment in the area is done through Grand Center, Inc., the Vandeventer-Spring Redevelopment Corporation (VSRC), and City Center Redevelopment Corporation CCRC). CCRC was created in February 1980, VSRC in March 1998. Grand Center, Inc in March 1987. Over the years members have come and gone for all three, currently Grand Center’s President Vincent C. Schoemehl, Jr. is the primary member of all three. These organizations have the ability to issue municipal bonds to fund projects. Patterson: I’m curious why community leaders like Tom Reeves, Peg Weathers, Emily Pulitzer, etc were directors of two redevelopment corporations for many years but not 2011 and later. A disagreement? Schoemehl: The state required social security numbers after 2010 and lawyers advised against our limiting the sharing of such info to the smallest number of people possible; liability issues. Thus I am a sole direct. Patterson: Thanks for the quick reply, but I’m confused. I’ve never had to submit my social security number to the SoS. It seems everything submitted by corporations is public record — no ss #s. Also many of these people are still on the Grand Center board. Can you clarify so that I can understand? Schoemehl: Let me check with Will Zorn, our lawyer. I’ve not yet heard back on a more logical reason why these individuals are no longer serving as directors of the two redevelopment corporations, many are still directors on Grand Center’s board. Because of a 2009 lawsuit we can learn more from documents, including deposition transcripts. In a June 2013 deposition Emily Rauh Pulitzer didn’t recall being a director of the organizations. Emily Pulitzer being sworn into the deposition. 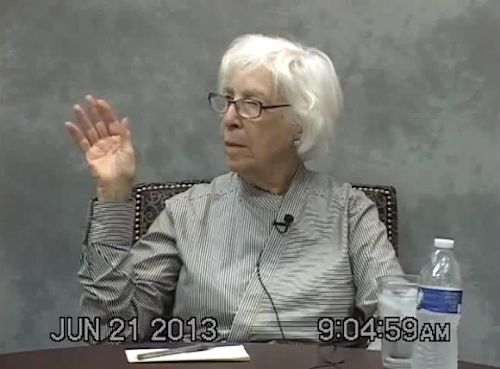 In this 5 minute video from the deposition, Pulitzer starts off saying she wasn’t on the board of either at a prior date but when shown documents she says at 4:30 “well, I guess this indicates I was a member.” For the complete context, the above clip starts at 1:12:15 in the full two hour video deposition. The transcript is here. 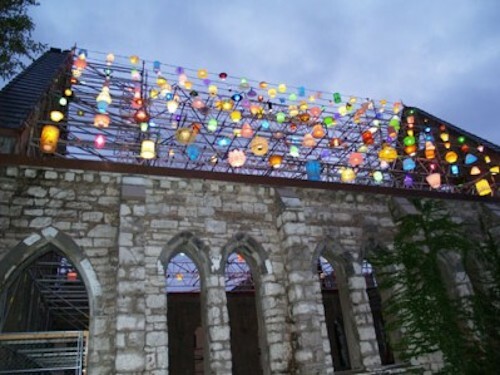 As a director of the redevelopment corporations, Pulitzer moved to borrow funds to stabilize the Spring Ave Church so it could be used in conjunction with The Light Project exhibition the Pulitzer Foundation for the Arts was hosting. This would appear to be a conflict of interest. The stabilized Spring Ave Church on New Year’s Day. 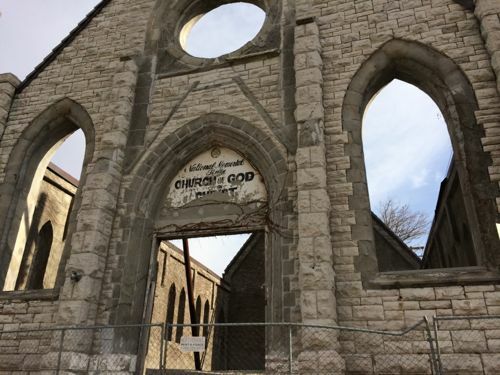 The church and lot to the north are owned by Grand Center, Inc. Case 0922-CC01036 – PAUL GUZZARDO V GRAND CENTER INC ETAL was voluntarily dismissed last year, Plaintiff Paul Guzzardo has indicated he plans to refile the case within the next 90 days. I intend to go through the transcripts of the five depositions in this case, looking for more information on how these quasi-governmental boards conduct their business. Major media, the St. Louis Post-Dispatch, in particular, declined to report the information presented here. The Post-Dispatch was previously owned by the Pulitzer family. I didn’t understand the reference to Guzzardo in Steve’s post above until I read your Sept 18 report, quite a back story, (the link to the case number above gives no real information) The elites of St. Louis are their own worse enemy. Thanks for the link. I agree Elaine’s story is good for the backstory, but while I appreciated it I’m not quite sure what is so earth-shattering. The main allegations seem to be that there is a contractual dispute b/w the artist and GC over the Media Box concept and that the cozy, inbred redevelopment boards didn’t use best practices and members have since fled them. The potential conflict of interest on the lighting project for the church seems rather minor. The article also seems to make some rather dubious points such as an apparent claim that the planned use of eminent domain for the Media Box was a major reason for changes in the state statutes on e.d. I also don’t understand the Post-Dispatch insinuation here… the paper is no longer owned by Pulitzer and I think there is no loyalty to her there now and more likely quite the opposite. I’d like for the Post-Dispatch to continue coverage of the publicly-funded ZMD and if a lawsuit against GC is re-filed I do hope they follow it. 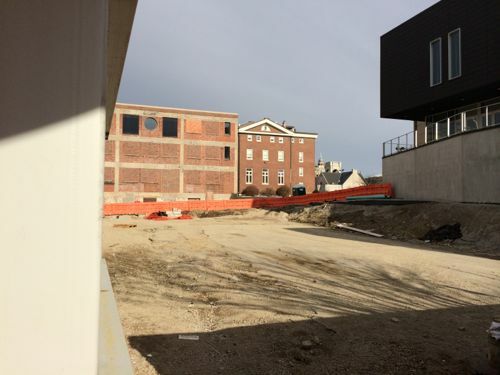 But for now there doesn’t seem to be much for a paper to report and the management issues not nearly as controversial as those involved in the publicly-funded Science Center and Historical Society. To read the story on Guzzardo and Grand Central, scroll down to Sept. 18. This is an important story. But it is complicated, and you really need that earlier blog post by Elaine Hopkins on Guzzardo – Pulitzer – Pratzel to connect all the dots.http://peoriastory.typepad.com/peoriastory/2013/09/paul-guzzardo-and-the-fight-for-the-heritage-of-st-louis.html The questions is what’s going to happen now? Maybe everybody who voted for that loan and resigned thinks it’s over because the City Attorney punted on Bosley and Archibald . But this is a Federal case. It seems to involve the municipal bond market. And nobody wants St. Louis to turn into Detroit. So I suspect a lot more is going on here, or soon will be. That video deposition of Pulitzer is quite a ride. And it’s not just her “off again – on again” board of directors riff. But there’s that chicken egg story line, the one about the loan and the light project. Anybody who wants to know a little more about the sequence should check out the ZKM | Center for Art and Media Karlsruhe web site. There’s some pre-2008 material on Spencer and Finch. They’re the artists who did the 2008 big bulb burnt church installation. Paul Guzzardo is a Research Fellow at the Geddes Institute for Urban Research at the University of Dundee. Guzzardo is a media activist who has been instrumental in bringing McLuhan’s media discourse into dialogue with urban discourse, in particular around the issues unfolding in Grand Centre with the creation of the Public Media Commons. The Media Commons for St. Louis was an idea initiated by Guzzardo a number of years ago. Guzzardo’s direct action research slides between the law, property, intellectual property, media space, and the social formations that congregate around them. His work is interesting to us at the Geddes Institute because it highlights the way cities refashion their publics by refashioning their downtowns, this is nowhere more apparent than in the promotional video for Grand Centre. His book-length work in progress ‘Hackerspace for mythmaking: the manual’ [hosted on the Geddes Institute website at http://www.dundee.ac.uk/geddesinstitute/library/hackerspace/%5D is both the summation of years of work in media and is itself a form of media direct action urban guerrilla warfare gaming: McLuhan’s version, if you will, of GTA. If there is an emerging digital urbanism, its most profound form will not be in infrastructure projects and their effects – which is the way most discussions of the city and the digital go – but in the way in which both city and digit, equally assimilate to media; and as we know, the media is the message. P.S. In this regard, Guzzardo is updating the thought of the botanist and city planner Patrick Geddes who, almost a hundred years ago, argued that the city is literally, in its fabric, its streets, its walls and spaces, our most significant storehouse of knowledge. There are some interesting issues here.Why has the board resigned? What are the real reasons – bonds? I would like to see this story followed in the St. Louis media. This needs to be cleared up especially since KWMU and Channel 9 are involved because of the Media-Commons build-out. Could their funding be impacted? Grand Center seems to have big plans and feel like the “commons” (see video at top of article) is going to attract people from around the world. This is not a public space in the sense of let’s say a traditional square or plaza in that it wants content to be the attraction itself. In other words the actual city planning that surrounds the site of this” commons” lacks an urban design that can organically feed the site with pedestrians. This normally is done many ways. Anything from a transit collection center, or be a part of a commercial/ residential neighborhood than can feed the “commons” or located in a prominent spot that is well traveled because it is in a crossroad. Nor are there any venues that feed the “commons” directly. Instead there is a huge parking garage and parking lot across the street from the entrance to the “commons”. Lets say the garage across Olive was torn down and a major theater built,then it might begin to address public use of the “commons” in a natural way. Although even there, the relationship between a new theater and the “commons” would have a tenuous connectivity at best because of crossing Olive Blvd and the configuration of the entrance to the “commons”. So that leaves the content of the “commons”, that is, videos and performances. From the video above it looked like people could experience much of what happens on their computer at home. Certainly live performances would attract visitors, and that helps. I’m just not convinced. I would be concerned that the novelty of media on walls will end. It would have been interesting to see Mr. Guzzardo’s approach. And while Mr. Geddes may be correct saying that the city is a significant storehouse of knowledge. It is easy to see in the modern era, at least in St. Louis, the storehouse of knowledge concerning the art of city planning is completely ignored. (also see Camillo Sitte) Instead the success of the “commons” literally is going to rely on smoke and mirrors. without the Geddesian archive, Alexandria after the fire. So the question that St.
noetic economy. The smoke and mirrors may be symptom of this condition. Is this not the sort of urbanism that Venturi addressed? I don’t think Venturi’s generous interpretation of urbanism is meant to salvage poor urban design. Without live performances or media shows how many people would be attracted to this Grand Center “Commons”? Probably zero or near zero. This is quite a contrast to many successful plaza’s squares (or commons) around the world that succeed by being integrated into the city fabric a part of daily life. I have reviewed some writings in “Hackerspace” and feel what Mr. Guzzardo did in downtown St. Louis better represents the potential of media. Media is essentially another design component in the urban environment. It is a design element like a row of Corinthian columns or the rhythm and patterns of windows or cornices. In fact media of some type or another goes back to signs in ancient times that identify shops or other buildings. Mr. Guzzardo (with other artists) in downtown St. Louis creates an art that the passerby can engage if they so desire.The art can be compelling or not, but it is still part of daily life. It is similar to a pedestrian visually engaging the capital of a column or patterns in brickwork or going about their business. But even in these locations, it is architectural and urban design elements that are part of the total experience. The difference is, relatively speaking the columns other design elements stay, while the media experience ends and perhaps morphs into another flexible experience and another part of daily life in these districts. It is the same with Mr Guzzardo in downtown St. Louis. solutions. However, while doable, it is an uphill battle since there are many structural problems with the “Commons” site in its relation to the larger, surrounding urban environment and how it functions. This lack of concern or understanding of how to build a people orientated environment is prevalent throughout St. Louis and has been for decades. As Mr Gedde points out environments are the memories the civilization. 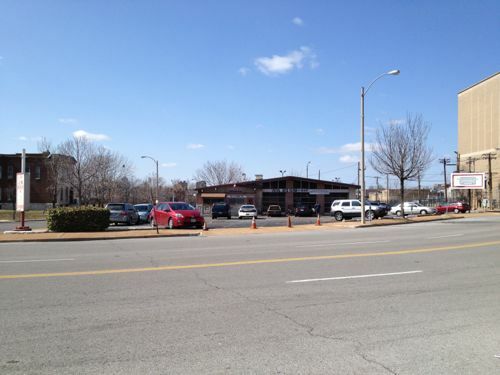 Right now that memory in St. Louis is of parking lots and mishandled public space. The scraped clean environment is the memory. The environment is never knowledge free. It is in part why the same mistakes keep being made. It is smoke and mirrors because, as the Urban Review report indicates, the boards and elites that run this city for the most part wouldn’t recognize art if it tapped them on the shoulder. So they resort to calling on famous names and making outrageous claims, like the “Commons” will become a world class urban space. It might be helpful if they studied the storehouse of knowledge that makes up true world class urban spaces before they present their grandiose ideas. If the “medium is the message”, are not architecture and urban design part of the medium?